Snow always makes things look prettier or scarier. 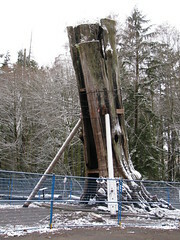 During the snow storms of December, I didn't get a chance to take pictures in Stanley Park. I was always driving through the causeway enroute somewhere elese. 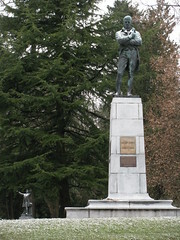 Thursday morning, I was able to stop at the Robert Burns and Lord Stanley statues, the Hollow Tree, and Prospect Point. 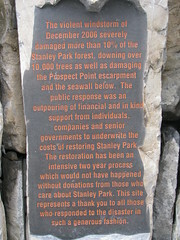 The light snow cover really emphasized the damage caused by the big windstorm of 2006. It opened up many new views never seen before. And to Lord Stanley, famous for donating Stanley Park… and of course the Stanley Cup – the holy grail of hockey! And to Robbbie Burns, of course…. with Lord Stanley in the background. 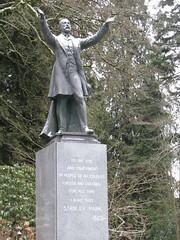 This entry was posted in Main Page, Robert Burns & Burns poetry, Vancouver Heritage and History on February 27, 2009 by Todd. Scotsmen walk and drink how much per year? average Scotsman walks about 900 miles a year. Scotsmen drink, on average, 22 gallons of alcohol a year!! This entry was posted in Main Page on February 25, 2009 by Todd. Seattle Gung Haggis Fat Choy, Sunday February 15th. Gung Haggis Fat Choy III in Seattle Washington: 200 strong and amazing! take their manic Gung Haggis Rap south of the Canadian border. Here they stand with Red McWilliams (left) and Don Scobie (right), following an exciting Seattle program of Chinese lion dances, Scottish bagpipes, Chinese dancers, Highland dancers, and the Asian Youth Orchesta. – photo Deb Martin. It was 5pm at Ocean City Restaurant in Seattle's International District, the day after Valentine's Day. Where were you? Todd Wong, Joe McDonald and Deb Martin, were still driving to Seattle after a 2 hour delay at the US Border. They arrived about 6pm, as the Kenmore & District Pipe Band has just followed David Leong's Bellwon Martial Arts Lion dancers. 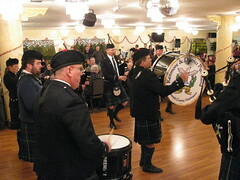 Joe McDonald raps the Address to the Haggis, “An' legs and arms and heads will sned like taps of thrissle”, while Bill McFadden and Todd Wong look on – photo Deb Martin. 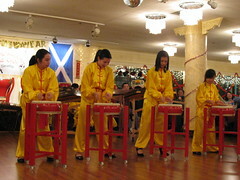 Bill McFadden, producer of Gung Haggis Fat Choy III in Seattle, set up a program that really featured Seattle's youth, by featuring the Melody Chinese dance Group, Karen Shelton Highland Dancers, and the Asian Youth Orchestra. 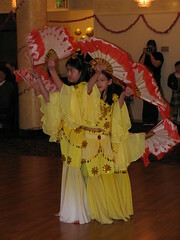 This entry was posted in Asian Canadian Cultural Events, Cultural Fusion, Gung Haggis Fat Choy dinner, Main Page, Multicultural events, Recent Reviews, Scottish, Gaelic, Irish Celtic events and stories, Seattle Gung Haggis Fat Choy, Vancouver Area Adventures on February 18, 2009 by Todd. Heather Pawsey performs this Sunday on rail cars! She is one of the most adventuresome and creative performers that I know. Through her unique music series “New Music in New Places,” She has sung in mines, a wine vat, at the aquarium… Now she will be singing in rail cars. Sunday, February 15, 2009 at 7:00 p.m.
by the Canadian Music Centre. and Leslie Uyeda’s Classical Escapade (world premiere), among others. footwear suitable for boarding railway carriages. 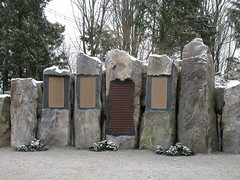 spanning North America, Europe, Asia and Australia. to the CMC in appreciation and celebration. the Government of Canada through the Canada Music Fund. 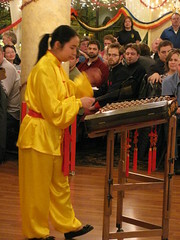 This entry was posted in Gung Haggis Fat Choy dinner, Main Page, Upcoming Events on February 15, 2009 by Todd. 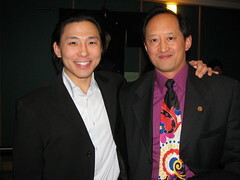 “Voices of the Pacific Rim” is a talent showcase for Asian-Canadian opera singers in this Vancouver Opera production. I loved last year's show, and while this year's show was equally enjoyable, it still left me wondering why a show titled Voices of the Pacific Rim featured so many European opera arias sung in German and Italian. For $20, this is one of the most pleasurable and affordable opera recitals you could attend. The musicianship is superb. The singers are crowd pleasers. And you have to wonder, why you didn't invite more of your friends to join you. This is a wonderful way for Vancouver Opera to reach out to Vancouver's many Asian communities, by featuring performers and songs with Japanese heritage this year, and Korean heritage last year. Gina Oh is the music curator, as she was for last year's show. But this year, the young Korean-Canadian was named one of the top 100 Koreans by the Korean Consulate for her work in helping promote culture. Sam Chung is a member of the Vancouver Opera Chorus, and will make his official debut with the VOA as a soloist in the upcoming Rigoletto. He gave a very fine performance of his talents in two solo turns. Sam had a commanding stage presence, with a voice that seems larger than his 5'6″ frame. Jessica Cheung is always a delight to watch. She brought a delightfully charming attention to her aria from Mozart's The Abduction from the Seraglio. This entry was posted in Main Page on February 15, 2009 by Todd. 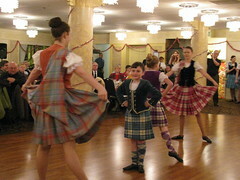 Gung Haggis Fat Choy SEATTLE… this Sunday! Gung Haggis Fat ChoyTM III !!! Ocean City Restaurant – 609 S. Weller St.
Jen Sookfong Lee will give a reading on Granville Island at Emily Carr University of Art + Design. I really enjoyed reading Jen Sookfong Lee's debut novel, The End of East. It updates “the Chinatown story” from past incarnations by Wayson Choy in “The Jade Peony” or “Disappearing Moon Cafe” by SKY Lee. Jen brings a grittier edgier approach to dealing with family and Chinese-Canadian identity issues. In fact, the protaganist tries to escape her family and its issues by disappearing into Montreal, until she is dragged back to face then in Vancouver. Lee's writing is thoughtful, and her in-person readings and talks are very delightful. She will sometimes address that it was her grandfather's head tax certificate that inspired her to write some of the aspects of this story. Sometimes it's the third generation that often tries to rediscover what the 2nd generation was trying to cover up, or deemphasize in their own ambitions to blend in and assimilate into Canadian society. Jen Sookfong Lee featured at CBC Radio Studio One Book Club – we check it out! The following information is courtesy of Rita Wong, our featured poet at the 2009 Gung Haggis Fat Choy Robbie Burns Chinese New Year's Eve Dinner. This reading is free and open to the public. All are welcome. find out more, visit www.sookfong.com. The On Edge series gratefully acknowledges the support of the Canada Council and Emily Carr University. first collection of stories, Blueprints for a Red Paper House. 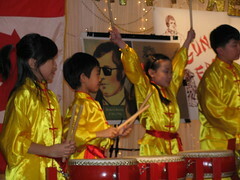 This entry was posted in Asian Canadian Cultural Events, Chinatown Vancouver, Chinese Canadian History, Literary Events, Main Page, Upcoming Events, Vancouver Heritage and History on February 10, 2009 by Todd. Some of my favorite opera arias are set in Asian. The famous tenor aria Nessun Dorma, is from Puccini's “Turandot”, set in ancient Peking. Puccini's beautiful “Un Bel Dei” is from Madame Butterfly, set in Japan. I like playing both of them on my accordion. And the “Flower Duet” from Lakme, composed by Delibes, is set in India. You will recognize this from many television commercials. It is always so exciting to hear it performed live. Here's a beautiful version on youtube with Sumi Jo & Ah-Kyung Lee. And then there is also Bizet's “The Pearl Fishers” set in Ceylon. It's a wonder that in a Pan-Asian city such as Vancouver, there isn't a real push to feature more Asian performers. Music has always been a prime mover in breaking down racial barriers. 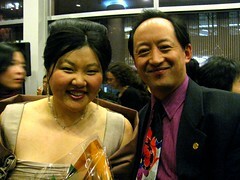 The Vancouver Opera is featuring their 2nd annual “Voices of the Pacific Rim” recital. This show features young Asian-Canadian artists. 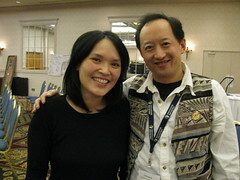 I got to know Jessica Cheung, Gina Oh and Sam Chung, when they did the Vancouver Opera Touring production of “Naomi's Road,” which debuted in September 2005. I saw the show many times in many venues. The opera was based on the children's novel “Naomi's Road” which was based on the adult novel “Obasan” by Joy Kogawa. 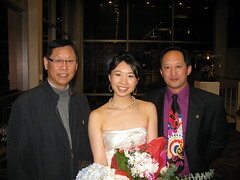 This entry was posted in Asian Canadian Cultural Events, Cultural Fusion, Joy Kogawa & Kogawa House, Main Page, Music, Upcoming Events on February 9, 2009 by Todd. 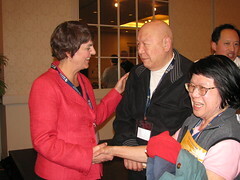 Todd Wong (CUPE 391 Vancouver Library Workers) with Carole James, NDP leader, and Judy Darcy – president of HEU (Hospital Employees Union). The Canadian Labour Congress has organized Winter School for 32 years at Harrsion Hot Springs Resort. This was my first time attending, as I am still on my first year being on the executive of CUPE 391 Vancouver Library Workers, as a member-at-large. I was enrolled in the course, “Unions in the Community.” Even though I am recognized by many people as a community leader, and community organizer, I learned many things about community organizing. I was amazed at the depth and involvement of my class mates in their communities and union locals. On Monday, the first day of classes began. 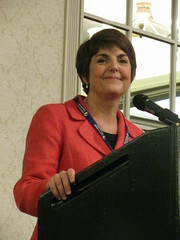 The evening featured a speech by BC NDP leader, Carole James. Carole talked with Fred Kay, a retired long shore man, and veteran of the CLC Winter School. It's always a pleasure to catch up with Jenny Kwan, MLA for Vancouver Mount Pleasant. This entry was posted in Main Page on February 6, 2009 by Todd. 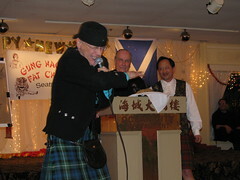 See Vancouver Mayor Gregor Robertson cut the haggis “wi' ready slight” at the 2009 Gung Haggis Fat Choy: Toddish McWong's Robbie Burns Chinese New Year Dinner. 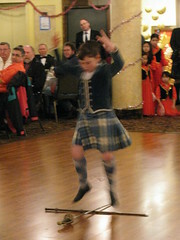 First timer Louis attended the Gung Haggis dinner, sitting at the Stuart Mackinnon table. He has created a really nice little video, collecting some of the highlights of the event. See the Gung Haggis Fat Choy Pipes & Drums, pipe in the haggis. See Joe McDonald and Toddish McWong perform “The Haggis Rap” with guest rapper Ndid Cascade. See opera soprano Heather Pawsey sing “Jasmine Flower” with Silk Road Music ensemble. This entry was posted in Main Page on February 5, 2009 by Todd.